The event recognizes films that are likely positioned as awards contenders. 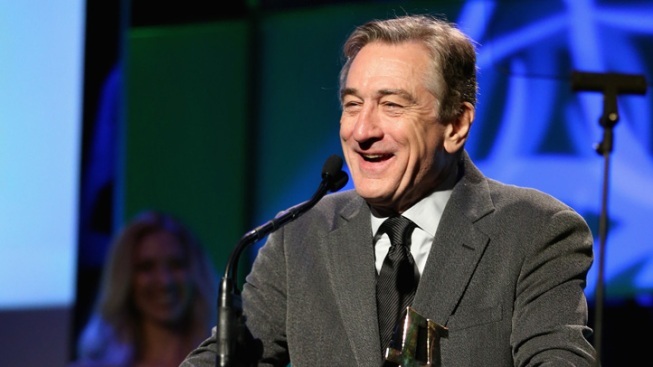 Actor Robert De Niro accepted the Hollywood Supporting Actor Award at the 16th Annual Hollywood Film Awards. Hollywood warmed up for its awards season with a love fest that recognized top actors and directors for films that haven't been released yet. Robert De Niro, Bradley Cooper, director David O. Russell and writer-director Quentin Tarantino were among the honorees Monday at the 16th annual Hollywood Film Awards, which bills itself as "the official launch of awards season." The event recognizes films that are likely positioned as awards contenders, such as Tarantino's anticipated "Django Unchained." In accepting his award for screenwriter of the year, Tarantino remarked that it was strange to get an award for a film he's still working on, but added that he could use it as ammunition to defend long dialogue scenes during the editing process. "I'll be able to say, hey, you want to take a line out of my AWARD-WINNING screenplay?" he joked. Seth Rogen presented the comedy award to writer-director Judd Apatow, whose film "This Is 40" opens at Christmastime. "Perhaps the most amazing thing about this awards show tonight is that none of these movies have come out yet," Rogen said. "I haven't even heard of some of these movies yet. That's how far out they are. "It's nice because it kind of feels like these are the new Golden Globes," Rogen continued. "No one knows what it is. Who voted for this?" Festival founders say the awards are based on "bodies of work and/or a film or films released during the calendar year." "No one has seen my movie," Apatow said as he accepted his trophy. "This is just based on an assumption that it's good." De Niro, Cooper and Russell were honored for "Silver Linings Playbook," set for release later this year. Other honorees at the starry dinner at the Beverly Hilton Hotel included Ben Affleck and the cast of "Argo," Amy Adams, Dustin Hoffman and Marion Cotillard. Richard Gere received a lifetime achievement award.